This is the second part of a report entitled "Airport investment in Africa - overlooked by airport and other infrastructure investors". The first part was published on 7-Aug-2014. While the Airport City, or wider Aerotropolis concept, may have been identified originally in the US before moving into Europe and Asia Pacific (especially China) and while Africa may have been late to embrace it, the continent is no longer a slouch where these commercial, airport-oriented cities are concerned. Necessarily sourcing income will be vital. The PPP model is probably key, but "teamwork" will be needed. According to data published by Professor John Kasarda, one of the original advocates of the airport city and aerotropolis concepts, in 2013 there were 38 operational or developing airport cities or aerotropolises in North America, two in Central and South America, 20 in Europe, 17 in Asia Pacific and seven in the Middle East and African regions, which were lumped together, of which just three in Africa. Notably, two of Africa's three airport cities are in the continent’s most powerful economy, South Africa – at Johannesburg and Durban (South Africa’s third city) (both are recognised as developing aerotropolises) – while the other is at Cairo (an airport city that will be vastly expanded). It is hardly coincidental that two of these three cities also have two of the three busiest airports in Africa. That is not necessarily the case in North America, where smaller airports like Edmonton and Hamilton (Canada), or Piedmont and Northwest Florida Beaches airports (US) have such facilities. Nor in Europe, where Athens, Bremen and Warsaw airports occupy the same zone as giants like London Heathrow, Frankfurt International and Amsterdam Schiphol for airport city development. Nor in Asia Pacific (Clark International in The Philippines and Cochin in India for example). So there is a heavy concentration of airport city style developments in Africa in very large cities in the north and south of the continent. Durban has access to two ports in close proximity. Cairo still has a port but its main maritime access and egress is via Alexandria, some 110 miles (180 km) to the north. Cairo was mentioned earlier in this report. In 2013 Egypt's Ministry of Aviation said it was planning to commence a USD200 million airport city development at Cairo International Airport on top of existing facilities there, starting with a business centre, then an entertainment park following the guidelines of Disney World in the United States. There would also be parks, an artificial lake, game courts, a water park, 18 cinemas and several restaurants; all part of the long-term development and modernisation plan. By Aug-2013 the Ministry of Civil Aviation was reporting that USD3 billion in investments had been pledged, and a 410,000sqm site was designated for the facility. Not long after, the Ministry was saying the government planned to construct an EGP100 billion (USD14.5 billion) airport city covering 10 million square metres around Cairo Airport. The project would be undertaken in several phases over seven years, with the first phase to commence in Jan-2014. The project would include a free trade zone, 1.7 million square metre cargo zone, catering facilities, entertainment area, offices, hotels and a hospital. Without doubt an enormous project, even if the figures might be a little overstated. Durban was also previously mentioned, in the opening remarks. King Shaka Airport, site of the Dube Tradeport, lies between two of the country’s biggest ports of Durban and Richards Bay. The Phase 2 development there under a 60-year master plan will take it to 70 hectares and it is heavily influenced by agriculture and the growing and storage of farm produce in an integrated perishable cold storage supply chain on a 16-hectare site, under glass. Other industries represented include automotive. The Tradeport investment was made by local companies to the tune of USD68 million over a two year period. The Special Economic Zone around the airport will grow in time to 700 hectares, supported by a reduced tax obligation for tenants; VAT benefits; government incentives; and a one-stop-shop in which to do business. The net effect is that 16,500 jobs have been created already. In terms of international agreements an MoU has been signed with an Indian company to take on a 140-hectare site. At Johannesburg, the Ekurhuleni Metropolitan Municipality is the responsible authority and it finalised the master plan for an aerotropolis at OR Tambo Airport in May-2013. The plan forms part of the municipality's 2055 growth and development strategy. The aerotropolis forms part of the government's Durban-Free State-Gauteng logistics and industrial corridor project. Cost details remain sketchy. All that is known for sure is that the project is one of President Jacob Zuma’s flagship Strategic Infrastructure Projects under the Presidential Infrastructure Co-ordinating Commission, which is overseeing the investment of R850 billion (USD796 million) in total during the next three to five years. Does the African benchmark for airport cities limit them to large cities with attendant ports? Is this a de facto benchmark for an airport city development in Africa – that it can only be in large cities with large airports and preferably ports close by as well? Basic theory of the aerotropolis states that only large airports within large metropolitan areas with a self-sustaining economy and a cluster of Fortune 500 (or similar level) companies on which to base further economic growth should even attempt to create one. But as we see, there are quite smaller cities that have successfully got them up and running, at least. The CEO of the Dube Tradeport believes that there is the potential for more airport cities in South Africa and beyond. Where would they be? In South Africa itself Cape Town must be high on the list of potential airport city candidates, serving a metropolitan hinterland of 3.8 million people, being Africa's third main economic hub city, with both an airport (the country’s second busiest) and a port and with primary established economic clusters in energy generation and IT amongst others. In Aug-2013 Cape Town International Airport (CTIA) confirmed its intention to “become an aerotropolis” while admitting it needs to partner with a variety of stakeholders to realise this aim. The idea for a Cape Town aerotropolis was first mooted in 2012. Also in the frame is Port Elizabeth, another major port (close to the airport) and centre of South Africa’s motor vehicle assembly industries. A new industrial zone is already under development there. Both Cape Town and Port Elizabeth are ACSA managed airports. In the private sector there could be opportunities for airport city style and wider aerotropolis developments at Lanseria Airport, referred to earlier, which is conveniently situated in the further northern Johannesburg suburbs almost midway to Pretoria, were it not for the OR Tambo aerotropolis referred to above, which has a head start. Beyond South Africa and Egypt, for any African airport to have a realistic opportunity of achieving airport city or aerotropolis status it again needs to be a large one (or one capable of rapid expansion), anchored to a significant economic base that includes foreign companies, and preferably with an important port and standing at a crossroads of adequate surface transport. There are not many that fit those categories. There are for example four airports in Nigeria that claim ‘airport city’ status, but none of them are acknowledged by Professor Kasarda’s strict criteria that are governed by economic clusters, government tax support, transparent strategic planning and so on. A Free Trade Zone has been established at Lagos Murtala Muhammed International Airport, with anticipated investment of USD500 million over five years. Nigeria is Africa’s most populous country with almost 170 million people; but Nigeria is increasingly off the radar for FDI owing to corruption and political (terrorism) fear factors amongst others. In the foreseeable future financing might more readily come from within Nigeria itself for the projects envisaged there. The growth of both passenger and cargo traffic at Casablanca’s Mohammed V International Airport – Africa’s fourth busiest – and its proximity to mainland Europe, for which it acts as a gateway, suggests that it has many of the credentials required, while Addis Ababa’s Bole Airport which acts as a hub for Ethiopian Airlines, threatens to eclipse Nairobi Airport as the main gateway to East Africa. An outside bet might be Cape Verde, the collection of offshore islands some 400 km from Senegal that were once a Portuguese colony but which have thrived since independence into a politically and economically stable country of 500,000 people. While most of the main islands have an airport the main two are at Praia, the capital, and on Sal Island, which has a very long runway. Over the last 10 years Cape Verde’s tourism arrivals have multiplied many times over. In Nov-2012 it was announced that the government of Cape Verde planned to raise capital for a strategic aviation hub serving West Africa. A proposed airport would have capacity for 50 million passengers per annum and would be constructed in three phases. Phase one and two would establish a fully operational airport at a cost of EUR310 million (USD413 million) and phase three would fulfil the goal of developing the airport as "a consumer-centric and commercially driven strategic aviation hub", modelled on the UAE's Dubai Airport. Not a great deal of progress has been made on this ambitious project but Cape Verde does offer, apart from the attributes mentioned earlier, the benefit of a strategic mid-Atlantic location that makes it both a perfect air and sea hub and an economic crossroads for much of Africa and Europe, the Americas, the Middle East and parts of Asia. However, as time passes the shape of long haul air services is shifting towards non-African hubs. See related report: Cape Verde to imitate Dubai? Senegal itself could also be considered appropriate to an airport city, having become the de facto non-oil economic and political capital of West Africa, the regional headquarters of US companies and of political organisations. But Cape Verde scores with its leisure/tourism infrastructure, which is second to none in the western part of the African continent. So there are potential individual opportunities for foreign investors scattered across the continent, but we need again to consider the overall picture. Apart from Africa’s share of global airport income being so small, it does score well when comparing known income and costs. In the table below it can be seen that in Africa in 2012 total income (aeronautical and non-aeronautical) exceeded total costs (operating and capital) by 55%. The worst performer in this respect was the Middle East, where there are many major capital projects under construction (+4.8%), while the World average was +18.54%. One of many conclusions from these statistics is that there is much more scope remaining for construction in Africa. Africa also at least holds its own in the measure of total airport income per passenger in 2012, being only slightly less than that of Asia Pacific and Latin America. In fact, and quite surprisingly, aeronautical income per passenger was higher than in Asia Pacific, Latin America and North America in 2012. It is really only in non-aeronautical revenues that Africa lags behind, having the worst per passenger average of the five regions reporting, but then again only just behind Latin America at USD4.62 versus USD4.86. One proven and ever more popular way of raising non-aeronautical revenue contribution of course is through charging for airport car parking. In this respect Africa has the third largest average of car parking spaces per airport of six regions surveyed but the lowest daily income per car parking space. Looking at debt-to-equity ratios, where a high ratio generally means that a company has been aggressive in financing its growth with debt and which can result in volatile earnings as a result of the additional interest expense, Africa as a whole has a higher existing average ratio in its airports then an investor might prefer though it would be unreasonable to refer to it as ‘debt ridden’ and it was only marginally worse than Europe in 2012. With the current ratio (current assets divided by current liabilities; essentially an airport’s market liquidity, its ability to pay off its debts within a 12-month period) Africa scores surprisingly well. The general rule of thumb is that while acceptable current ratios vary from industry to industry, they are generally between 1.5 and 3 for healthy businesses. If a company's current ratio is in this range, then it usually indicates good short-term financial strength. If current liabilities exceed current assets (i.e. the current ratio is below 1), then the company may have problems meeting its short-term obligations. If the current ratio is too high, then the company may not be efficiently using its current assets or its short-term financing facilities. Africa has a current ratio (2012) of 1.92, nicely within the standard parameters, compared with a low (Asia Pacific) figure of 0.77 and a high (North America) one of 3.97. So, in brief and using these measures, when judged against other regions Africa scores highly when comparing its ratio of airport income to costs; holds its own in generation of income per passenger; performs poorly in non-aeronautical revenue generation from car parking, a revenue stream that is all the rage globally; does not score well in its debt-to-equity ratio; but does so with its current ratio. Something of a mixed bag for investors to contemplate. Throughout Africa, as in India, the Public-Private-Partnership (PPP) will probably be the key to improving airport infrastructure. Some existing African examples were given earlier. The PPP is applicable, but not entirely so, to the African continent. PPPs entail higher transaction costs, independent of project size and are inappropriate for low value projects. Despite these caveats, and especially (4), a small airport in India (Cochin/Kochi) was one of the first successful PPPs despite being a "niche" airport (almost all traffic was guest workers to the UAE and other Gulf destinations). Now it handles intercontinental network carrier air services across Asia and beyond, is building a new terminal, three times the size of the existing one and has its own aerotropolis. Can airports prosper within a government financed framework in Africa? It is important though to remember the opportunity cost of not having air services. Government subsidies to airports are not only necessary in many cases, but can also produce a decent rate of return on investment when the criteria are expanded to include the social and economic benefits that airports drive for the nation and society. One frequently quoted example is Ouagadougou International Airport in the capital of the landlocked African nation of Burkina Faso. This is a facility with low traffic volumes (less than 0.5 million ppa, almost all of them international) and would surely not be on anyone’s privatisation ‘radar’. So it will subsist on government subsidies for the mid to long term. But is that a bad thing? Not necessarily. We ought to consider the ‘opportunity cost’ of not having an airport and air services, particularly in this poor nation with unsatisfactory road and rail infrastructure. Just a few practical issues to consider: How could the country participate in the regional and global political processes? (The President of Burkino Faso played a key mediating role in two separate African national disputes. The ‘shuttle diplomacy’ was only possible with a functioning airfield!). How would the country maintain a diplomatic presence and trade links with the world? Even the basic question of getting national representatives to the UN would be tricky; the same holds true for having sports teams attend the Olympics or other such events. And what about the high value imports and some perishable agricultural exports which need a point to land and take off. When you weigh the cost of political and economic isolation and resulting detrimental effect on economic growth against the subsidies which support air services, the ‘subsidies’ turn out to be a very good deal; indeed, the return on investment is quite high. There are hundreds of Ouagadougous and many of them in Africa. In fact only about 600 of Airport Council International’s 1700 member airports have traffic volumes of over one million passengers. While some of these manage to break even, most are subsidised by local or national governments. Not a bad thing when one considers for example the importance the European Union attaches to small regional airports in the EU as essential to social cohesion and to national prosperity. The continent itself is spawning investors such as the South African investor Harith, which together with Nozala (a women’s investment company) and the Public Investment Corporation (a government-owned financial services provider) took control of Lanseria Airport in Nov-2011 in what is a groundbreaking PPP. As referred to earlier, there is a multitude of small airports, even serving capital cities, which continue to operate courtesy of government largesse, their managements acknowledging that no matter how many airport finance conferences they attend and network at they are very unlikely in the near future to attract foreign private direct investment. 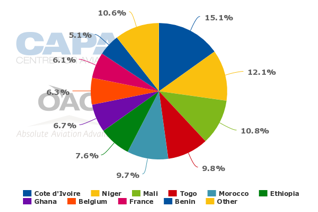 The big opportunities lie with the larger airports mentioned in the table ‘Top airports in Africa by pax numbers, 2012’ and especially those associated with airport city developments either now or in the future. With western airline schedules to and from Africa growing out of Europe, North and South America, the Gulf and Turkey, with more direct flights from China likely to come, more profitable African airlines rising to their challenge, and with investors from Europe, North American and China already sniffing out opportunities, on balance the answer is that while the continent is not being overlooked as such perhaps not enough attention is being paid to those opportunities.